Charlie Slater throws Paul out of his house. Gloria tells Paul that she wishes her mother would leave her father. Max is stuck for a driver for the business. Julie bumps into a man on her way to work. She explains she's in a rush to get to work because there's a new bank manager. 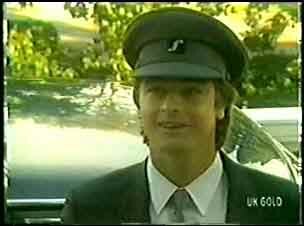 Shane is offered a job as a chauffeur. Max shouts at Terry that he knows she has a husband and says she should keep away from Shane. Max tells her not to play the innocent. Max says that she should keep away from Shane, he doesn't like loose women. Terry says she only kissed Shane, but Max says he's fed up of living in a permissive society. Terry says that Max shouldn't judge her by his standards. He rants at her to get out and to keep away from Shane too. Terry is stalking down the drive as Shane arrives home. She tells him they'll talk about it at dinner. Shane comes in and asks Max what's going on - why did he fire Terry? Max says that she refused an out-of-town job and therefore had a bad attitude. Shane says it's no wonder Terry was upset - but he'll hear her side of it tonight at dinner. 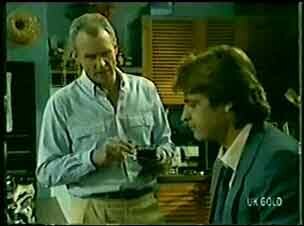 Max tells Shane that Terry is married. Shane says that they're just two friends going out to dinner. Terry's personal life is her own business, not Max's. Max forbids Shane from seeing Terry again - he could make a real mess of his life getting hooked up with a married woman. Shane says it's tough luck - he's going out with Terry anyway! Julie and Marilyn are gossiping about the new bank manager - they haven't met him yet. Julie is sent on an errand to the manager's office - it turns out to be the man from the street! He introduces himself as Philip Martin and tells Julie not to worry about their previous meeting. He tells her that he wants to make the bank a pleasant, friendly place of work. He wants to get to know all his staff well so that they can work well together. Julie looks at a picture of Phil's children - Michael, who is seven, and Debbie, who is nine. Apparently they live with their mother in the country. He asks after Julie's family and she explains their family setup. They chat about hobbies as well - Julie tells him that she likes historical novels. They are getting on very well. When they've finished their conversation, Philip asks her to send Marilyn in next. At the counter, Marilyn grills Julie about Mr Martin. She tells Marilyn to go in to meet him. Jim is looking at some plans on the kitchen table when Max comes in for a bit of chat. He starts going on about Shane and Terry. He says Daphne may have been a stripper, but at least she was single(!) Jim reasons that Shane and Terry might not be getting involved. He asks if Terry lives with her husband or if she's separated. Max doesn't know. Jim says the best thing Max can do is to not get involved. They can't live their lives for their children - they have to make their own mistakes. Jim thinks Max is using Terry as an excuse - Max hasn't forgiven Maria for being unfaithful to him all those years ago. Max admits that he's never forgotten it. Julie is heading to the shopping centre after work when Philip Martin offers her a lift. Shane is ranting to Jim about Max's attitude earlier that day. Jim recommends giving Max a few days to calm down - he might take Terry back on his own. Jim tells Shane that Max does everything for Shane's sake - he just tries a bit to hard sometimes. He can be a bit over-protective. Shane sort of understands where Max is coming from, and says he'll probably be the same when he has his own kids. They talk about Danny's paternity - Shane is still keeping it to himself, as is Jim. Shane doesn't think they can keep it from Danny forever, though - but how do you bring it up in conversation? The phone rings and it's Julie. She tells Jim that she'l be late home for dinner - she's going out for drinks with the new bank manager. Shane and Terry are having a drink and chatting about his new job. Shane also tells her to give Max some space - he'll get over it in a couple of days: Max is OK once you get to know him. Terry explains about her marriage. She's never told anyone before. She married young and it was a disaster right from the start. Her husband used to live off her wages as an apprentice, then he went into criminality - house-breaking and the like. After a while he robbed the Pacific Bank. 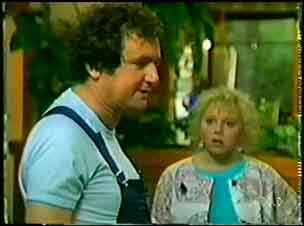 Terry tells Shane that Inglis is her maiden name - her husband's name is Gordon Miller. It's the same Gordon Miller that was in Shane's accident. She didn't tell anyone because she really needed the job with Max. Shane is very shocked, but says he won't tell anyone. Terry asks if this has put Shane off her. He says he doesn't know - it's a lot to take in. Shane says he's confused and will need time to think. They decide to give dinner a miss - suddenly Shane hasn't got an appetite anymore. Shane has turned up on the first day of his new job. He's driving a posh and rather prickly woman called Mrs Fielding in a large car. She tells him they're going to Canberra. Shane looks very surprised, but heads off. Shane calls at his house to get a few things for the trip. 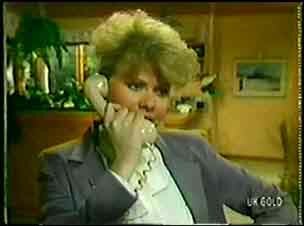 Mrs Fielding is talking on a car phone (very posh indeed back in 1985!) She can't get through though, and comes into the house to use the Ramsay's telephone. Max is mocking Shane's new uniform and asking about his date with Terry while Shane is gathering up his things. Shane is surprised when Mrs Fielding follows him into the house. She asks to use the phone and rings up about the broken car phone. She gives orders to fire the bloke who repaired it! Then she tells the person on the other end of the phone to book a hotel room for two under the name Shane Ramsay. Max hears this and looks shocked.